Simple exercises, no doubt, but researchers claim that they are some of the most effective. Walking, jogging or swimming too bring happiness, control blood pressure and sugar besides prolonging life by exercising muscles rapidly. Gyms require costly fancy equipment and carry risks of injury if erratic. What about the Trampoline? Something simple enough without bother and fuss, rather inexpensive too comparatively speaking and something every child would love. Fun and sporty, the trampoline would last years and years with gentle care. Put it in the backyard and watch it become a favorite of the little ones. Well, the kids need something to do and this activity is healthy enough. It might just keep them away from several addictive habits nowadays common in the school and in residential neighborhoods with contraband easily accessible. What is it and how does it work, you might be asking? All it has is a rather sturdy and safe platform meant for bouncing around. What happens if you fall off? The enclosure ensures that the child does not fall to the ground and thus no risk of injury. That is called a combo and the platform without the enclosure would certainly be risky since fun could lead to injury especially with unsupervised small ones. The 15-foot Trampoline incorporates a heavy duty structure that is actually made of galvanized steel and would last for an eternity and never rust. That frame is not going to bend out of shape either with the welded T-bracket technology that strengthens individual joints. The steel is covered by foam for additional safety. How do you get the bouncing quality? It comes from the springs, as many as 96 of them at 6.5 inches, galvanized large springs! Vinyl coating covers both the frame and the springs and you know why. Worried about slipping on the jumping mat? The material that prevents slips and falls is the heavy duty polypropylene that is UV protected too. The Trampoline supports weights within 200 lbs. Yet it may not be wise to let more than one child at a time get the fun for safety sake if unsupervised. 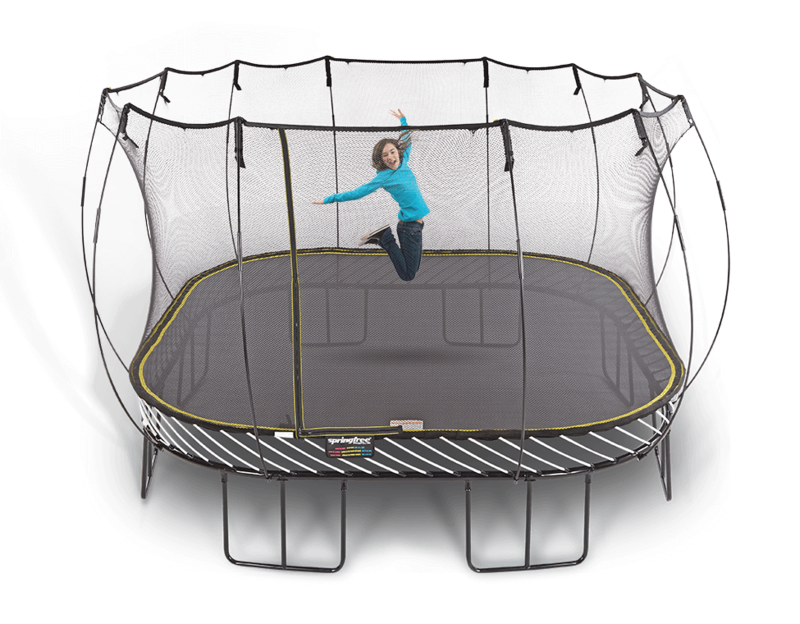 Any worries about its performance would disappear when you know of the one year warranty besides the large number of satisfied users who would vouch for the Trampoline on social media. After you have received the two lightweight boxes that together weigh 216 lbs., putting it all together is quick and simply done. You don’t have to thread any ropes anyway. The enclosure net is already attached to minimize the fuss of setting up. All you need is the space and the willingness of the happy kids. The very thick PVC material ensures complete safety. Forget about possibilities of injury. No gaps exist where the child might slip through. You do have cheaper stuff on the market and larger Skywalker units are also available. Make sure that the material is taken good care of. Dogs and cats could easily damage the stuff. Fire would destroy the synthetic materials very quickly. Installation should be best done in an isolated corner of the backyard without thoroughfare. Why would you want such an aesthetic contraption? The interests of children come before our own. The health and fitness of the kids mean so much to us especially nowadays when too many drugs and mean things abound. Engaging the youngsters with enough activities and diversions to keep their interests focused and filling up the off school hours would help immensely. At a young age, fun activities matter more than anything else. When they outgrow the fairy tale like bouncing device, some other family with small ones could use it. This little blue magical contraption with no hefty price tag comes with all the advantages! Let it be a surprise birthday gift to your own children or a friend’s. Create a culture of interest in healthy fun activities from the very beginning to ensure happy and healthy lives for the future. Bring home the Trampoline for a little bit of Disneyland fantasy for the kids. Today make money online option gets huge popularity. Most of the online jobs allow their user to work from the comfort of their own space. But, most of the people fear that the price of the online business is too expensive. You will be able to earn you desired money online without spending a huge amount of money to begin. Just Switch on your PC or laptop and get to work. For the longest time the Internet would drive individuals off when it came to receiving money. They felt they couldn’t deal with the procedure. More individuals are attempting to make money online than any other time in the recent past. Much of this can be credited to the economy that has been battling all through the world. Regardless of the fact that you advise individuals how to profit online commonly, that still won’t help. You think informing individual how the procedure works is all you would require to do. The reality is that in many times it never works out for some individual. Here is some detail why for some online job can be an actual tough proposition. Getting a check from the web is something millions have never delighted in, however generally as numerous have. The bait of having the capacity to sit before your PC and win cash is the thing that keeps individuals returning. One thing that numerous individuals neglect to acknowledge and that is gaining cash online is a genuine occupation and not some amusement. It is tough work and ordinarily harder than a disconnected from the net employment you may have. It is easy to lose heart once you come online for the very first time. Individual who has never attempted to make money online are star struck by all the chances that are available. With the world being your commercial place you have numerous distinctive alternatives. The key is not to lose your center which numerous individuals do and that prevents them from acquiring cash. Today most of the individual prefer make money online, you have to choose reliable platform. For individuals who think they require no money to gain online better get that out of their head. Regardless of what you do online ordinarily, you may need to put in some of your own cash. Yes there are examples of overcoming adversity that began with nothing, yet those are uncommon. You can be fruitful on the web, yet it is not going to occur without any forethought. You must pay your contribution and buckle down for all that you get. We all would like an immediate achievement, however for most it doesn’t happen that way. It is a process that will require some investment so remember that. Much of the writing online seems to cater to middle school kids, which is appropriate in terms of readability. Research belongs elsewhere. So, how can we draw in surfers, capture their interests and succeed in selling products and services? Online readers seem to be in a tearing hurry. Words catch eyes or eyes catch words, we do not really know which. A few seconds is all there is to capture attention. Like gunfire, let it be short, sweet sentences, half sentences too, individual phrases and words placed separately. A personalized language that appeals to feelings and emotions would draw the readers in. Avoid difficult words and complex sentences. Several online tools like the Flesch-Kincaid Reading Ease score would help simplify approaches. Use dictionaries. Statistics reveal that images rule our lives and that includes television screens and camera phones. Most articles carry pictures to drive home the meaning. Yet language too is often pictorial and carries images within words that liven up the proceedings. Scatter thoughts and ideas in meaningful imagery like being in the middle of a lonely island to indicate a tight spot. Avoid those passive constructions. While avoiding the complicated, use strong verbs like rushed instead of ran. Speed up the meanings and action by reinforcing what you say in a sustained manner. Make sure that readers understand each bit of meaning, precisely worded. Research reveals the most common phrases surfers use to find websites. Something like ‘travel by train’ perhaps. Webcontent Writing should contain the kind of language surfers would use. That helps to rise in the search engine rankings with better chances of visibility. If you write about hunting, do some keyword research. Linking to other websites, articles and research papers bring an element of seriousness and networked feel. As we see so commonly in social media, liking something results in sharing and most pictures, videos and writing reflect a happy attitude. Let the profuse writing be pleasing, flowing like the river with goodness and vitality. Whether it is a call to action or sharing a little secret, the conclusion should contain a farewell gift like we see in many parties, cute tokens of happiness. Writing with feeling can end with a sweet parting message. It could be a link to know more. Say it with flowers.